Pneumonia is an inflammation of the lungs caused by bacteria or viruses, says Dr. Antonio Arrieta, CHOC’s Pediatric Infectious Disease Specialist. There are many kinds of pneumonia. Bacterial pneumonia is often a complication of a pre-existing condition. In addition, “Pneumonia is often viral in origin, particularly with babies and children under the age of two. Other viruses like RSV and the flu can cause pneumonia,” says Dr. Arrieta. The patient’s chest can fill with fluid and this can lead to complications like compressed lungs and difficulty breathing, he adds. “Symptoms include fever and cough, and in the very young, those may be the only symptoms. In older children, particularly those older than six months, you will notice their respiratory rates go up because they need to oxygenate their blood so they breathe more often. There can be chest pain. If it is bacterial in origin, the fever can be higher,” says Dr. Arrieta. A case of the flu should go away in three to five days but bacterial pneumonia can last much longer, Dr. Arrieta says. Certain groups of people are more at risk, says Dr. Arrieta. Children younger than five years of age are at risk for bacterial pneumonia. “After five the risk drops substantially,” he says. Children under one or adults over 65 are at greater risk for complications of pneumonia resulting from the flu. Kids and adults with underlying medical conditions or chronic illnesses like asthma, diabetes or heart disease also face a higher risk. 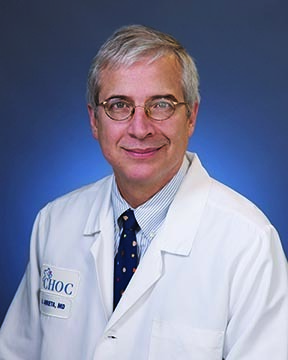 Dr. Arrieta has worked at CHOC Children’s since 1991. He is the director of pediatric infectious diseases and director of infectious disease clinical research, and specializes in the treatment of serious community acquired and nosocomial infections. Dr. Arrieta completed his fellowship at UCI Memorial/Miller Children’s Hospital in Long Beach and his pediatrics residency at Southern Illinois University. When a child gets sick, parents may be surprised if the pediatrician isn’t quick to pull out the prescription pad for an antibiotic. Most seasonal illnesses like respiratory infections, the flu and the common cold are actually viral infections, for which antibiotics have no effect. In many cases, your child’s doctor will recommend treating the symptoms until the infection runs its course. Getting a cold or the flu is a bummer for anyone, but these common illnesses can be extra challenging for children with asthma. Viruses more often than not will worsen asthma, says Dr. Wan-Yin Chan, a CHOC Children’s allergist/immunologist. Already, people with asthma have inflamed airways to the lungs. Coughing and sneezing prompted by a cold or the flu adds extra stress on these airways, which can trigger an asthma attack. It’s normal for young children to be scared of the dark, or apprehensive when they experience a new place, for example for a six-year-old to be afraid of going to the doctor. Parents can prepare their kids by talking these things out. There are plenty of germs flying with you in that airplane. People should bring waterless, alcohol-based hand sanitizers or wipes with them on the plane. Use them before eating or drinking and after using the bathroom and washing your hands. Colic is the term used to describe uncontrollable crying in an otherwise healthy infant during its first three to four months of life. Typically colic is diagnosed if the baby is crying at least three hours a day, for three or more days per week and for three weeks or more.